Tonight, longtime Village Voice film critic J. Hoberman will be at International House to present a screening of Robert Aldrich’s Kiss Me Deadly. The nuke-scare noir is key in his new book, An Army Of Phantoms: American Movies And The Making Of The Cold War, published March 15, which traces the ways culture and history walk hand-in-hand—particularly with regards to Hollywood, Washington D.C., and Moscow from the end of World War II to the mid-’50s. Army Of Shadows, a prequel of sorts to 2005’s The Dream Life: Movies, Media And The Mythology Of The Sixties, is a dizzying feat of cinematic and historical scholarship, using primary sources to draw connections between Hollywood’s blacklist and the Tehran Conference, the Committee on Un-American Activities and the subtexts of films like Them! and Invasion Of The Body Snatchers. In preparation for his visit, Hoberman talked to The A.V. Club about some of his favorite, and not-so-favorite, Cold War movies. The A.V. Club: An Army Of Shadows views movies as historical documents as much as products of a filmmaker’s vision. 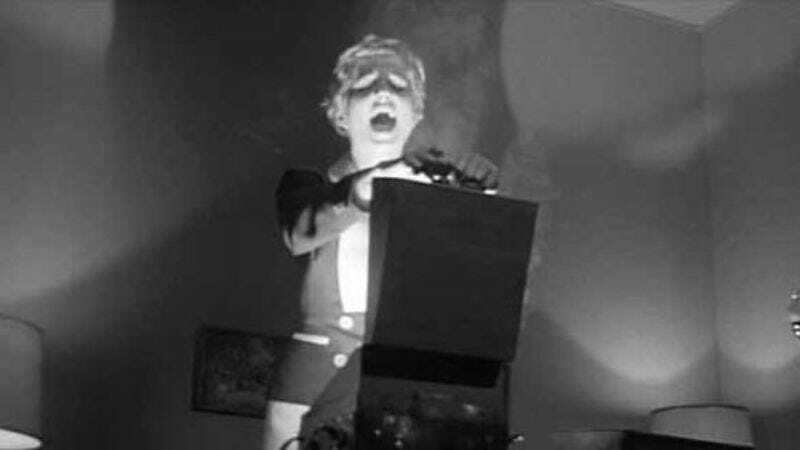 In some, like Robert Aldrich’s Kiss Me Deadly, it’s as if the filmmakers are venting the nation’s pent-up anxiety about war and nuclear annihilation. In the case of Kiss Me Deadly, did you get the sense Aldrich explicitly intended to do that? J. Hoberman: It’s hard to say—that wasn’t the original premise. They ran into trouble with the Production Code, so they threw in the comic espionage angle. But clearly, once it was in there, the movie’s inconceivable without that. They never would have had an ending like that with a heroin shipment. AVC: So the Production Code is the reason the contents of the mystery package Mike Hammer is trying to track down were changed from drugs to some sort of nuclear device? JH: I saw the correspondence. I don’t know what it violated; I thought there were other movies that dealt with drugs at the time. They also objected to other things—it was way too violent, the Mike Hammer character was amoral. But Aldrich had to play them. Some of the statements that he made about the movie were said deliberately to create a spin that the Production Code would go for. He emphasized that it was a critique of vigilante justice, then turned around and wrote an article in the Herald-Tribune saying he kept faith with all the Mickey Spillane fans. What I was suggesting at the end of the book, with that cluster of movies that came out in ’55, ’56, ’57—Kiss Me Deadly, The Searchers, Invasion of the Body Snatchers, Rebel Without A Cause, and A Face In The Crowd—is that it became viable, suddenly, for ambitious filmmakers to make political statements in their movies, and I think that’s what segues into [the era he covers in] The Dream Life. AVC: Invasion Of The Body Snatchers is particularly fascinating in that it can be interpreted as being on either end of the political spectrum—an allegory of either the encroachment of Soviet-style groupthink or a protest against the conformity of 1950s America. JH: High Noon is the same way. In both cases, interestingly, it was liberals or former Communists, definitely people on the left, making one kind of allegory that would be read as something quite different by people at large. Another thing about Body Snatchers is that nobody really got it when it came out. It took some Italian critics to point out that it seemed to be a movie about fear of Communism. AVC: Along with Elia Kazan and John Ford, Samuel Fuller is the filmmaker who makes the most repeat appearances in the book. Which film of his should we talk about? JH: Pickup On South Street is the one that’s the most significant, although The Steel Helmet is also a very important movie historically, and a movie that I like quite a bit. AVC: What’s special about Pickup for you? JH: Fuller takes a situation and just pushes it beyond the pale, goes as far as he can with it. He says in his memoirs that he knew he was making a movie about the Cold War. The degree he knew he was taking this radical McCarthy line (that it was the roughnecks, the dirty fighters, the lowlifes who would protect America) and making a kind of cartoon out of it, or whether he was just dramatizing how capitalism or free enterprise could play out in the Cold War—I don’t know. Fuller had an artistic sensibility. He came up with something that was rich and contradictory: “A good yarn,” as he would say. AVC: What about John Ford? Fort Apache seems to be the most important film for you. JH: Fort Apache is the key movie; Rio Grande is the one that’s most bellicose, the most obvious Cold War film. Ford is much more mysterious to me as a personality than Kazan or Fuller. I think that he was steeped in these American myths, Longfellow and Zane Grey—I don’t think it was Melville and Faulkner for him. He had a tremendous understanding of American narrative, American stories. He also was deeply influenced by his experience of World War II; afterward, he was making Westerns, but they were often war movies at the same time. That comes out in Fort Apache. AVC: During a meeting of the Director’s Guild at which Cecil B. DeMille tried to make it mandatory for members to sign an anti-Communist loyalty oath, Ford famously opened his opposing statement with, “My name’s John Ford. I make Westerns.” There’s a kind of calculated humility there; he’s simultaneously disavowing politics and laying claim to a bedrock American genre. JH: It was tremendously calculated. He was another one who worked both sides of the street politically. AVC: You definitely feel his war experience in his films. The parts of The Battle Of Midway he shot onboard an aircraft carrier comprise some of the most visceral, physically affecting combat footage ever shot—you can see the camera lenses being knocked out of alignment by the force of the deck guns. JH: Even in This Is Korea, even though it’s one of the most downbeat government-sponsored movies—I can’t believe they put that out in theaters. Of course, nobody wanted to see it, so it didn’t matter anyway. It’s as bleak as The Steel Helmet in its way. It’s hard to see. JH: We tried to get that [for the International House screening]; it’s almost impossible. There are people who admire it as a movie—I’m not one of them. I think it’s kind of awful. It’s not because it’s Red-baiting; I enjoy I Was A Communist For The FBI, and even I Married A Communist has its moments. But this, it’s just lugubrious. On the other hand, it has some genuinely horrifying scenes. The character of the the father, Dean Jagger, when he’s singing that song and parading around, and Helen Hayes’ hysterical scenes—to me, this is bad acting, but I can’t deny the intensity. AVC: Force Of Evil is the only movie that Abraham Polonsky was able to direct before he became one of the Hollywood Ten; it also starred John Garfield, whose life was essentially ruined by the blacklist. What about it stands out for you? JH: The basic leftist tenet that organized crime is just another form of capitalism. The thing is, very little attention was paid when [Force Of Evil] came out. They changed the ending, shortened it. It just fell into the cracks. What was interesting to me was that critique did not disappear. You find it in mob films that were made in the early ’50s, after the Kefauver Committee [which investigated organized crime], then it blossoms with tremendous force with The Godfather. I always felt that Garfield, he’s sort of the alternate Brando. A lot of the stuff that made Brando great is there. But Brando was 10 years younger, and he wasn’t marked by the ’30s the same way that Garfield was.